There are some people whose recipes I know I can rely on. That doesn’t mean I want to make every one of their dishes, but the ones that appeal to me have always come through. They include, in no particular order (and are not limited to this list because I'm sure I will forget someone), Pierre Franey, Barbara Kafka, Marcella Hazan, Ina Garten, Nigella Lawson (especially the recipes in How to Eat), Diana Henry, Rachel Roddy, Yotom Ottolenghi (Jerusalem is my favorite of his books so far), Luisa, The Wednesday Chef, Orangette’s Molly, and David Leibovitz, whose blog I follow and whose book My Paris Kitchen I cook from. For years I searched for the perfect split pea soup recipe and finally struck gold with the one David published on Living the Sweet Life in Paris, on March 15, 2013. With a few tweaks, I spend the winter shuffling between my adaptation of that recipe and Marcella’s recipe for Rice and Smothered Cabbage Soup on Page 94 of Essentials of Classic Italian Cooking. I find that the Vegetable Base makes it salty enough. If you don’t, add salt to taste as it’s cooking. Homemade garlic croutons are a nice touch as is toasted bread served with a sliver of blue cheese, which is David Lebovitz's idea. 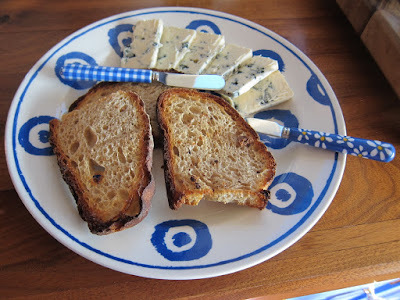 Cambozola Blue and Danish Blue Cheese are especially nice. 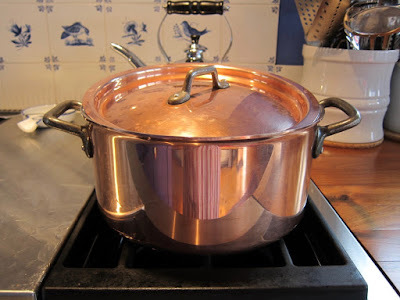 Cook the bacon until crisp in a large soup pot. Mine is 5 quarts. Remove the bacon, and set aside to crumble over the soup before serving. Add the olive oil to the pot. Heat it a little, then add the onion and carrots. Cook until the onion is wilted, then add the garlic, bay leaf, cubed potatoes, and the split peas. Sprinkle generously with black pepper and stir. Add the water and bring to a boil. 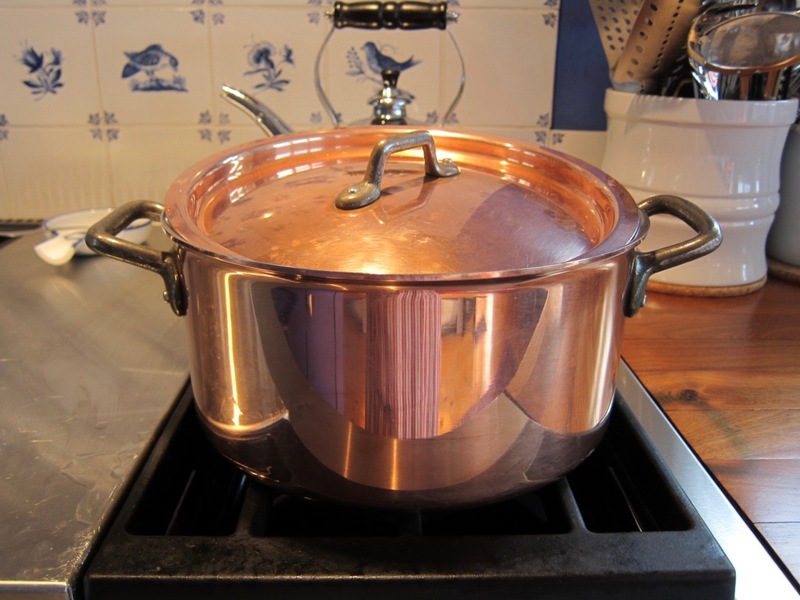 Reduce the heat to simmer, and put a cover askew on the pot. Stir occasionally. As it’s cooking, if you notice it’s thickening more than you like, add a little more water to get it the way you like it. The soup is ready when the peas and potatoes are soft. This generally takes about 45 minutes but can take up to an hour. When it's done, remove the bay leaf. 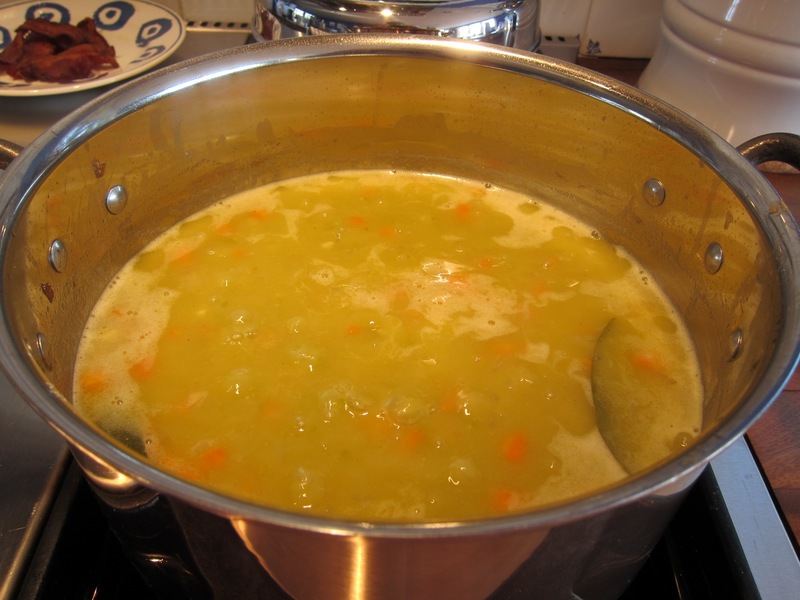 Leave the soup chunky or puree it with a stick blender - you choose. I leave it chunky. Serve with crumbled bacon bits,, if you are using bacon and dollops of sour cream. Leftovers will need to be thinned with water.